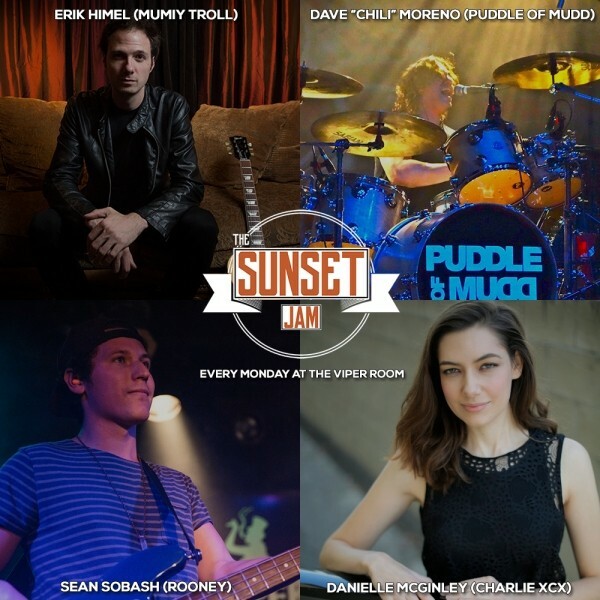 The Sunset Jam was created in January 2016 by guitarist Erik Himel to fill a void in the LA music scene. The concept of the night was to provide not only an over the top show for a non-musician crowd but to also create an environment where musicians could network, connect and be showcased. The Sunset Jam is unique in the sense that on a night to night basis musicians could be performing in front of record labels, A&R scouts, producers, songwriters, musical directors and bands seeking musicians. We accept new musicians to perform through an online submission process which allows players without major credits, but with the musicianship an opportunity to share the stage at a legacy venue alongside top touring/session players. Since our inception in January 2016, we've featured over 1000 unique musicians including A-List touring/session musicians for acts including Beyoncé, Imagine Dragons, Cee Lo Green, Robby Krieger of The Doors, The Doobie Brothers, Rod Stewart, Mumiy Troll, JES, Sabrina Carpenter, Selena Gomez, Alice Cooper, Christina Aguilera, Lifehouse, Leon, Alan Parsons, Scott Weiland, Linda Perry, Kings X, Cher Lloyd, Sweet, Gallant, Edgar Winter Band, Crazytown, Puddle Of Mudd, Matt Sorum, Bonham, Aerosmith, Foreigner, Billy Idol, Chris Cornell, Shania Twain, Seal, Filter, Smashmouth, Montrose, Slash, Rooney, Air Supply, James Blunt, The Voice UK, The Voice Australia, The Voice Greece, The Voice Israel, Thriller Live, Sheryl Crow and Alicia Keys.